Before we get into the goodness the title of this post suggests, I’d like to start off with a much-needed life update. I graduate with my Master’s in May, and that means it’s thesis time. Forty pages in, and I’m marching along. Digital marketing is such an analytical yet creative industry. You interpret data, yes, but you also have to imagine the needs and typical lifestyle of a user on your site or digital apps. While I was an English major in college, both of my Physics professors said I should be a physicist. One of them even wanted me to be a Physics TA and teach it! I love that mixture of objectivity and subjectivity. You can find this marrying of objective and subjective in cooking. There are some elements of the craft that you must follow, through and through, like don’t ever substitute baking soda with baking powder. Food is scientific. On the other hand, taste depends on an individual’s palate. Food is creative, too. America’s Test Kitchen is treating me well, too! I love working as a Web Editorial Intern. I’m writing their Facebook posts and some Pinterest pins. My blog series on the America’s Test Kitchen Feed is launching March 6th. So exciting! It’s called “#ATKVeg Better Together,” based on The Complete Vegetarian Cookbook. I’ll be highlighting unique flavor combinations in some of the book’s recipes, reflecting on each ingredient before showing how they are the perfect match. 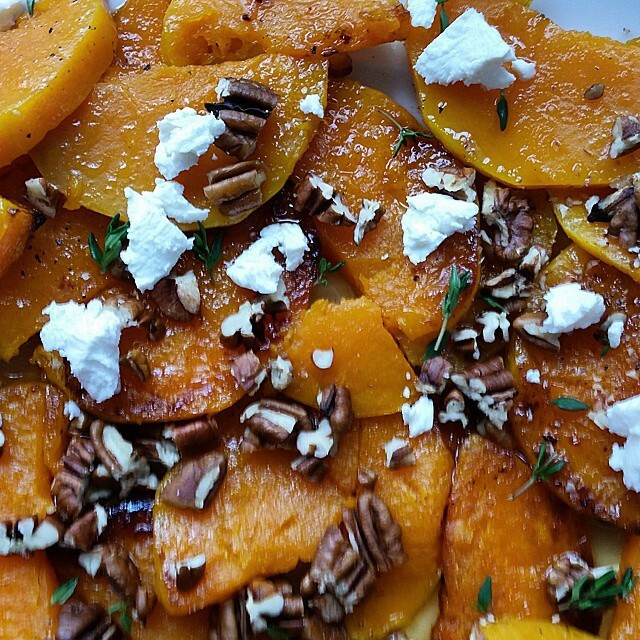 My first post involves Roasted Butternut Squash with Goat Cheese, Pecans, and Maple. How do goat cheese, maple syrup, and cayenne pepper taste together? Find out next Friday the 6th! Lastly, my grandmother passed away a few weeks ago, so I was out of town all last week. She inspired me immensely. I’ll have much more to say about her in a forthcoming post, a tribute to her and the glorious ice cream sundaes we always made together. Yesterday was my first day with no plans or obligations in a very long time. So, I thought I’d treat myself to a nice breakfast—something sweet but healthy. I craved two things: french toast and oatmeal. Having both would mean a carb overload. What to do? Fuse them together! Note: While I did not add this yesterday, I think a little orange zest would be a fantastic addition. Try it and let me know what you think! 1. Put the oats and milk into a medium pot. 2. Turn the heat to medium-high. Add the cinnamon, nutmeg, vanilla, and dried fruit. Mix all ingredients until fully incorporated. 3. Wait until the milk begins to boil on the sides, about 2 minutes. Start stirring more frequently to prevent the oatmeal from sticking on the bottom. Once the mixture starts mildly boiling, cook until oats are tender and reach desired consistency, about 5 minutes. I love my oatmeal nice and thick, but you may like yours more liquid-y. 4. Pour into a bowl and enjoy. 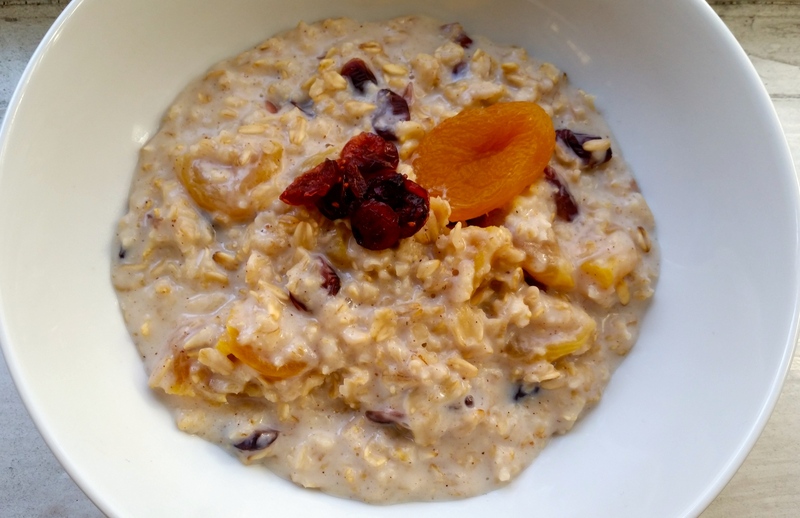 I recommend topping the oatmeal with real maple syrup, à la french toast! Hello! I hope you all are staying warm and dry this winter season. If you’ve seen the news, you know that winter has been especially brutal in Boston. I’ve almost fallen into ten foot snow piles multiple times. A kind stranger even helped hold me up to prevent a wipeout. With an additional two feet of snow expected this weekend, we are all wishing for the warm, sunny days of summer. 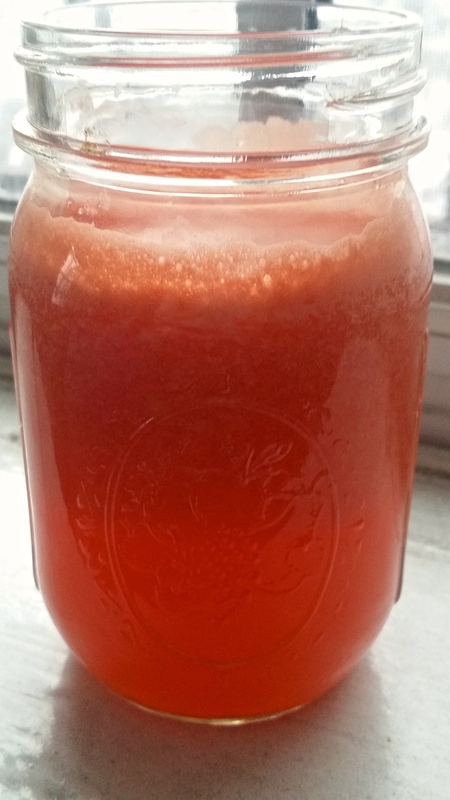 This morning, I decided to make a drink that would transport me to the beach with one sip. Refreshing watermelon mixes perfectly with brightness from freshly squeezed lime juice and a hint of sweetness from honey. Add seltzer water for the ultimate finishing touch. 1. Dice fresh watermelon into cubes (or you can buy watermelon already cubed). Add the watermelon to the blender. 2. Squeeze the juice of half a lime into the blender. 3. Add 2 teaspoons of honey to the blender. You can add more or less depending on how much sweetness you prefer. 4. 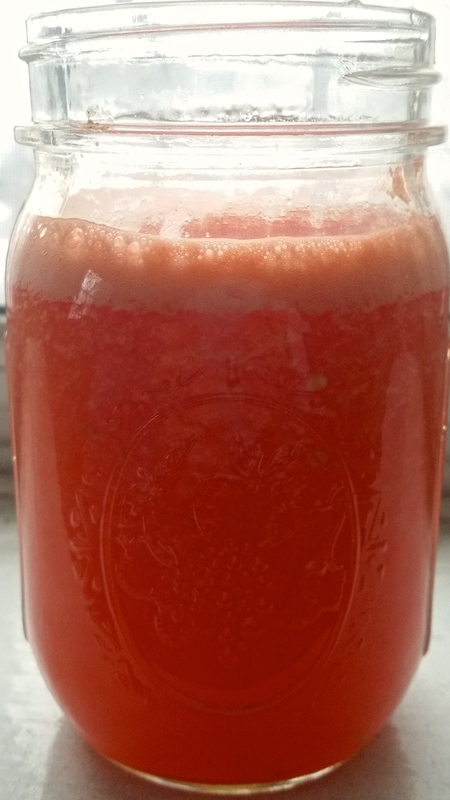 Blend until the watermelon is fully pureed. 5. Pour the mixture into a glass and add seltzer water to your taste. I added about 1 cup! Note: I used an immersion blender for this recipe. One of my Christmas presents was this KitchenAid beauty that comes with a blending jar (among other things)! Just take a spoon and mix it together again if this is bothersome to you. Quick, easy, refreshing, and healthy. Close your eyes and imagine that spring and summer sunshine!